Peel the skin of kiwi fruits and finely chop them. Cook it with green chillies and salt adding little water (about 1-2 tbsp) . 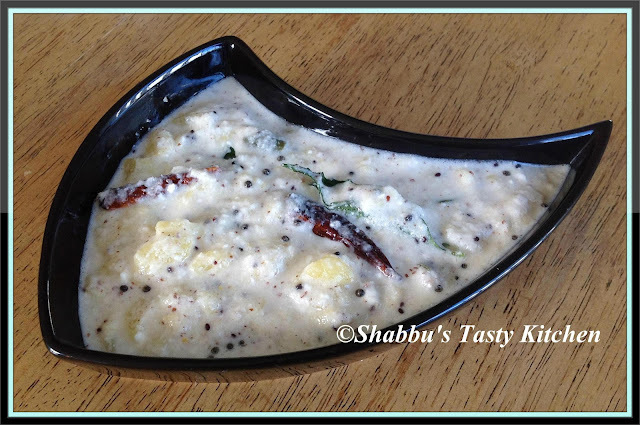 Grind together grated coconut, shallot and 1/2 tsp mustard seeds into a smooth paste. Add this paste to cooked kiwi fruit and cook for few minutes. Switch off and add yoghurt and mix well. Adjust salt.To this add 1/2 tsp sugar (for taste balance) and mix well. wow that is very innovative.. Innovative dish.. I usually don't like kiwi.. will try this. Due to my internet problem i can't able to give frequent comments to all of my friends. Give me your support to me and i'll join with you after my net problem solved. wow...what a delicious recipe !! !loved how you hav combined the ingredients !!!!! I am an admirer of pachadis SHabbu.But haven't tried with kiwi yet..Innovative. Wow what a nice way of using kiwi.I always end up with some semi ripe ones and has to wait for them to ripen to eat.Thanks to you I now know a tasty way to use up kiwi . New recipe...the serving dish is beautiful & attractive! Never thought anybody use kiwi in pachadi.. Wonderful creation..
Looks yummy too. Will try for sure..